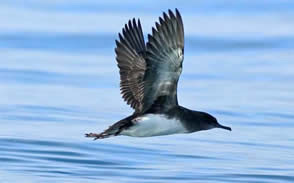 The nationally endangered Hutton’s shearwater/Kaikōura tītī (Puffinus huttoni) is the only seabird globally to breed in an alpine environment, with the only two breeding colonies remaining in the Seaward Kaikōura Range in the South Island of New Zealand. Kaikōura is therefore literally their last place on earth. The Hutton’s shearwater is a small black and white shearwater, 36-38 cm in length with a wingspan of about 75 cm. The upper parts are uniform brownish black. The dark brown of the cap extends below the eye merging into the white of the chin and throat. The dark hindneck extends down behind the cap to form a broad collar almost encircling the neck and upper breast. The rest of the underbody extending from the lower breast to the undertail coverts is white except for a small dark patch on the thigh and the sides of the undertail coverts. The underwing is off-white with broad brownish borders with extensive dusky grey armpits. Bill is long, slender, and dark grey. Iris brown. Leg is light to dark pink and mauve on the inside and pink and dark grey outside; feet pink with black webs. The Hutton’s shearwater/tītī was long known to Māori, providing a major sustainable source of protein to Ngāti Kuri, Tangata Whenua of the area. “Tītī” is the Māori name for a number of different shearwater species, particularly during the downy chick stage. In pre-European times, there was little red meat for Tangata Whenua, meaning chicks were a major sustainable food source for Māori. Chicks were harvested from their burrows shortly before fledging and preserved in pōhā/kelp bags for up to two years. If not eaten, they would also be traded amongst different Ngāi Tahu hapu for pounamu/greenstone etc. The feathers were also used for clothing and decoration. The introduction of predators and changes due to land development brought an end to the customary harvest. Ngati Kuri has actively supported tītī conservation, and collaborated with the Department of Conservation and Whale Watch to create an artificial insurance colony on the Kaikōura Peninsula. The name of Ka Whata Tu o Rakihouia Conservation Park, which incorporates the Seaward Kaikoura Ranges and the mountain colonies, comes from Ngati Kuri history and the tītī. Tītī are an important taonga/treasured species and Mahinga Kai. Mahinga Kai refers to the sustainable gathering of food and resources, the places where they are gathered and the practices used in doing so. This is central to the relationships of people with places and resources; and to the ongoing cultural, economical, social and spiritual wellbeing of Ngāi Tahu Whanui. As is transferring traditional knowledge about the natural environment from generation to generation. The environment needs to be looked after for our people, community, visitors, and wildlife – now and in the future. The Hutton’s shearwater was first officially described in 1912, and later there were anecdotal reports from high country farmers, hunters and various others of ‘muttonbird’ burrows at high elevations in the Seaward Kaikōura Range, behind Kaikōura. 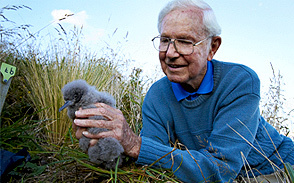 In 1965, following on from these leads, Geoff Harrow found carcasses in the headwaters of the Kowhai River at altitudes between 1,200 and 1,800 m above sea level, that were confirmed as Hutton’s shearwaters. Extensive searching led to the confirmation of eight colonies, but only two remnant colonies remain today. At least ten colonies formerly existed in both the Seaward Kaikōura and Inland Kaikōura Ranges; there is questionable evidence that the species may have bred beyond these mountains. From an estimated population numbering millions of birds, introduced mammals and changes in land use have decreased the Hutton’s shearwater population to less than half a million. There is an estimated breeding population of more than 100,000 pairs, with a similar number of non-breeding birds visiting colonies early in the breeding season. Despite this relatively high number the species is regarded as nationally endangered because of past declines (evident from extinct colonies) and the threats still faced today. The distribution of Hutton’s shearwaters within New Zealand waters is poorly understood as few at-sea observers attempt to distinguish Hutton’s shearwaters from the similar fluttering shearwater. There are sightings and beach-wrecked birds from Northland to Foveaux Strait, including East Cape and Westland, though it is apparent that the bulk of the population stays between Cape Campbell and Banks Peninsula, off the north-east coast of the South Island, when breeding. During the breeding season (August to March), Hutton’s shearwaters are present over the inshore coastal waters off Kaikōura. They fly low over the water and congregate in large flocks (rafts) before their evening flights to the mountain colonies. Only two colonies remain in the Seaward Kaikōura Range, on steep tussock-covered mountain slopes above 1,200 – 1,800 m altitude – making Hutton’s shearwaters the highest breeding seabirds in the world. The two alpine colonies are located in the headwaters of the Kowhai River (Uerau Nature Reserve) and on private land at Shearwater Stream under QEII covenant by the McArthur Trust (Puhi Peaks Nature Reserve). The larger of these two colonies is Kowhai River, at an estimated 106,000 pairs; while its smaller counterpart Shearwater Stream has around 8,000 pairs. These two colonies are the last remaining of eight that were once located in these mountain ranges. It is thought that the Hutton’s shearwater once also colonised the lower Kaikōura regions, but today’s remnant populations are now only found on these mountains tops. The Hutton’s shearwater is one of the few New Zealand seabirds to solely breed on the mainland. Birds arrive at their colonies from late August onwards, then spend two months competing for burrows and mates. Burrow densities vary within sub-colonies, and the average burrow is 3 m long. Pairs will lay a single egg between late-October to mid-November, the peak egg-laying period being in early November. The egg is laid in a hollowed out chamber at the end of a burrow which is 60 cm to 250 cm in length. The nest is made of tussock grass and sticks, then lined with feathers. The 50-60 day incubation period is shared by both sexes. Upon hatching the chicks are covered in soft grey down, and raised by both parents for 80 days. Chicks fledge the nest between mid-March to early April, once they have reached a suitable weight and are fully feathered. They depart the colony at night and undertake their maiden flight to the ocean, from which moment they are totally independent of their parents. Unfortunately fledglings are disorientated by the bright lights of Kaikōura, which lie in their flight path to sea, resulting in hundreds (if not thousands) crash landing. The Hutton’s Shearwater Charitable Trust therefore annually promotes a large volunteer effort, to save as many grounded birds as possible for release. Fledglings then migrate with adult Hutton’s shearwaters to the warm and fish-rich coastal waters off Australia, where they spend their first 3-4 years until returning to breed in Kaikōura. Adults also make this journey every year but stay only for the non-breeding season (winter). Hutton’s shearwaters have a longer chick-rearing period than other Puffinus species, likely due to the energetic costs associated with a colony located 1,200 m above sea level. Artificial light attraction and disorientation leads to the crash landings of hundreds (if not thousands) of Hutton’s shearwater chicks making their maiden flight from their mountain colonies to the sea, during the peak fledging season from early March to early April. Unfortunately the brightly lit township of Kaikōura lies directly in their flight path. Crash landings result in birds becoming grounded around Kaikōura and not being able to take-off again. Crash landings result in death by injury, starvation, dehydration and predation. Set nets along coastlines pose a threat to Hutton’s shearwaters, to what extend is unknown and needs to be determined. Hutton’s shearwaters predominantly feed on small fish and crustaceans, fluctuating food availability (from commercial overfishing and climate change) impacts breeding success. Other threats include climate, change, potential oil spills, plastic pollution and heavy metal pollution. Hutton’s shearwaters are in decline and unless their threats are addressed, this extraordinary species could one day be lost forever. In 2005 a third colony (Te Rae o Atiu) was established on the Kaikōura Peninsula, to ensure long-term survival. This was a joint project by Te Runanga o Kaikōura, Whale Watch and the Department of Conservation, with support from Forest & Bird and the local community. Hutton’s shearwater chicks were translocated from the Kowhai River colony (one of only two remaining wild colonies) in the Seaward Kaikōura Range to the artificial Kaikōura Peninsula/Te Rae O Atiu colony in 2006, 2007 and 2008. 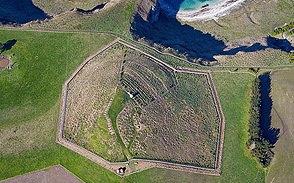 The Hutton’s Shearwater Charitable Trust was formed in October 2008. A predator-proof fence was then constructed in 2010, with further translocations taking place in 2012 and 2013. Chicks adapted well to their artificial burrows within the predator-proof colony. They were fed sardine smoothies for a 2-3 week period by an army of volunteers, regularly weighed and fitted with metal bands and microchips. During this time the chicks ‘imprinted’ on the site, ensuring they will one day return to the colony to breed. Translocated birds raised at the colony have already begun returning and producing offspring! The next translocation will likely take place in 2018. The Trust was formed to encourage and promote the conservation, research, public education and sustainable management of the Hutton’s shearwater. The Trust promotes awareness of the plight of endangered Hutton’s shearwater both locally and internationally, and generates support for research and conservation projects. The Trust is partnered with New Zealand’s leading conservation authority, the Department of Conservation. The Trust is contributing to protecting and restoring a New Zealand species and its ecosystem. The Trust aims to: 1) Manage a full suite of introduced pests at the two remaining wild colonies, 2) Monitor wild populations, 3) Encourage vital conservation research projects), 4) Successfully manage the translocated Kaikoura Peninsula colony, 5) Reintroduce Hutton’s shearwater to former colonies, 6) Involve local communities, 7) Educate and increase awareness. Help to conserve the Hutton’s shearwater by becoming a Friend, sponsoring a chick, purchasing merchandise or making an online donation! The Trust is also in need of a long-term sponsor – providing an opportunity to work together towards a brighter future for one of the world’s unique seabirds.